"The Sabres' active off-season and the promise of a healthy Jack Eichel is reason for hope in Buffalo. 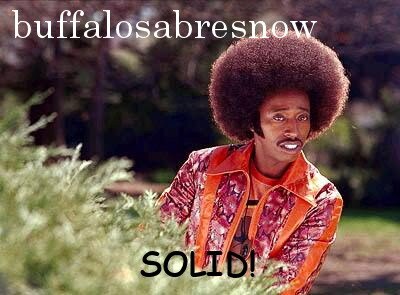 Will it be enough for the Sabres to climb the Atlantic Division, though?" reads the headline at THN. As they do with all teams in their 2017-18 season preview, THN places Vegas odds up top. The Sabres come in as a very long shot at 65-1. Nobody looks at this team as a Cup-contender and most in Sabreland would be happy for them to be playing meaningful hockey come mid-March and into April. Best-case scenario: Eichel's injury last season was a fatal blow to any playoff chances last year and while a sub-.500 percentage even with him in the lineup won't be enough, "the Sabres have more going for them than a healthy Eichel." The Sabres off season "addressed its off-season needs and could have a defense to match its offense...the rest is up to Lehner." Worst-case scenario: "Staying out of the Eastern Conference basement is dependent on health." THN points to the laundry list of injuries that occurred last season and that "the lack of depth up front is what makes injuries so damaging to the Sabres’ playoff hopes....and if they struggle to score, can this group even contend for a wild-card spot? Maybe with a top-five defense, but the Sabres don’t possess that." THN's PREDICTION: 7th in Atlantic. Few doubt Eichel’s ability to be a top scorer as early as next season, but he’ll have to wait to guide the Sabres back to the post-season. The blueline needs more stability yet and the bottom six needs to be solidified before the Sabres can really take a full step forward. 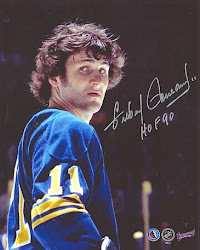 "No team shook things up more in the offseason than the Sabres," begins Gormley's 2017-18 Buffalo Sabres season preview as he states that the team cleaned house beginning with the GM and coach. He continues by checking off a litany of moves by new GM Jason Botterill to help change a team that scored the third fewest goals in the East while allowing the fifth most. Case for: The Sabres have some firepower up-front, "and if Robin Lehner proves he can be a No. 1 goalie, the Sabres could challenge the Boston Bruins and Ottawa Senators for the final playoff spot in the Atlantic." Case against: After revisiting Jack Eichel calling out his teammates and saying that it's up to new head coach Phil Housley to induce the culture change Eichel wants to see, Gormley rightfully notes that Housley has a tall task in front of him. "The Sabres will progressively get better under him, but there is a reason they finished with the worst penalty kill in the East last season. Until Lehner proves he's a capable starter -- the 26-year-old Swede has not had a winning record in the NHL since 2012-13 -- the Sabres cannot be considered a true playoff contender." Of course Evander Kane is Gormley's trade bait as the 26 yr. old winger is in the final year of his deal, of whom he asks the question, "Is there ever a year Kane is not the subject of trade rumors?" The general feel is that the changes were real good, although it may take a bit for them to take hold, and that Lehner will really need to follow up a solid season with an even better one. The "jolt" provide by big changes won't be enough and they still need more depth. Boylen points out that the Sabres have finished at the bottom of the Atlantic Division since the NHL rearranged things, but also states that they got a "consolation prize" this past season with the drafting of Casey Mittelstadt eighth-overall. Anyone who's watched his play over the summer and/or the goal shown in the video from Eric Vegoe (www.twitter.com/evegoe) will say that Boylen makes a good point. But Mittelstadt is the future, however near that may be, and the focus now is on the 2017-18 season. Same with Alexander Nylander, whom Boylen also points out in the first few paragraphs of his piece. When it comes to the here and now Boylen asks, "It’s about time this team took a leap, isn’t it?" and calls them the East version of the Winnipeg Jets--"a team of patience that has built through the draft in recent years, but one that hasn’t made any meaningful progress in the standings." Although he does point out that the Jets have made the playoffs once. Biggest remaining question: "The Sabres need an improvement in their goals this season." It's expected that Eichel and Ryan O'Reilly (and even Sam Reinhart) will get into the 50-55 point range, but "there are two veteran forwards in particular that need to step up." Kyle Okposo "needs to get over 60 points again" and Kane who is "supposed to be an elite scoring talent" but hasn't hit the 30-goal mark since the 2011-12 season. "Both players," writes Boylen, "have to bring it this year and if they do, the Sabres should make up all the offence they need to be competitive." "The future is bright in Buffalo. The lineup has holes, to be sure, but the rebuild is nearing completion. The division, and the rest of the NHL, can no longer sleep on the Sabres." "The Buffalo Sabres will take a step forward, although it still might leave them short of the playoffs." "Coaching makes a difference. This is meant to be less an indictment of Dan Bylsma as it is an endorsement of Phil Housley. They were two wins away from exiting the basement last season in the Atlantic, and with some smart additions in the offseason (like that Marco Scandella deal) it’ll finally happen." "A full season of Jack Eichel essentially guarantees improvement for the up-and-coming Sabres, who did well this offseason. Buffalo brought in a new head coach and general manager, and addressed its biggest weakness - defense - by acquiring Marco Scandella and Nathan Beaulieu. Playoffs might be a stretch, but the Sabres don't look like pushovers anymore." "Dark horse: Buffalo Sabres. They’re not Cup contenders, but don’t count out former Penguins associate GM Jason Botterill."